In the nutraceutical or pharmaceutical industries, manufacturers are required to quarantine ingredients and containers before for testing before they can be introduced into new products. Not only does this help limit contamination, but it also ensures consistent quality is achieved among the ingredients used. 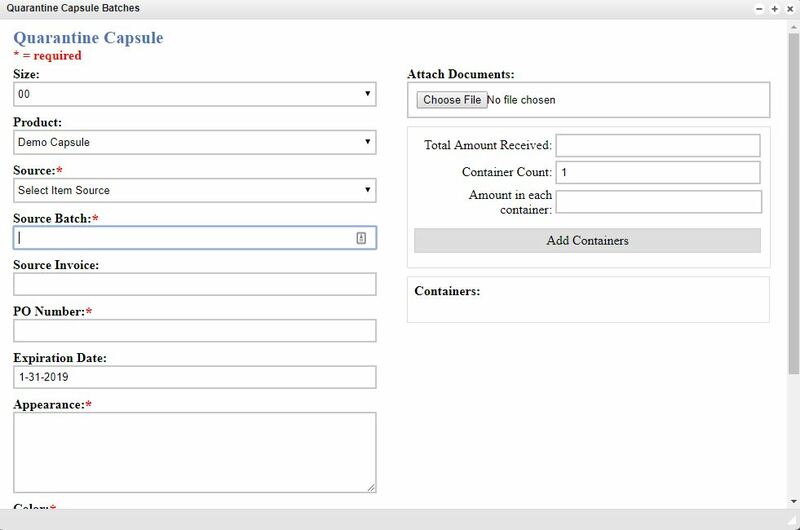 To help achieve this efficiently, the Quarantine Inventory window allows you to quickly create batches of new components or containers that may be being received by your facilities. From the components Quarantine Inventory window, you will see a variety of fields that can be modified to match the component or container that is being quarantined. Any required items are denoted with the * symbol. Once these required fields have been completed, click create batch at the bottom window to complete your new quarantined inventory entry. The Quarantine Inventory window for components or containers can be utilized to check-in Capsules, Case Types, Containers, Cottons, Cut Bands, Desiccants, Inserts, Labels, Lids, Scoops and Secondary Packaging Labels.